MONTRÉAL, Sept. 22, 2015 /CNW Telbec/ - Bell today marked the fifth anniversary of Bell Let's Talk by announcing the extension of the national mental health initiative for a further 5 years and an increase in Bell's total funding commitment for Canadian mental health to at least $100 million. 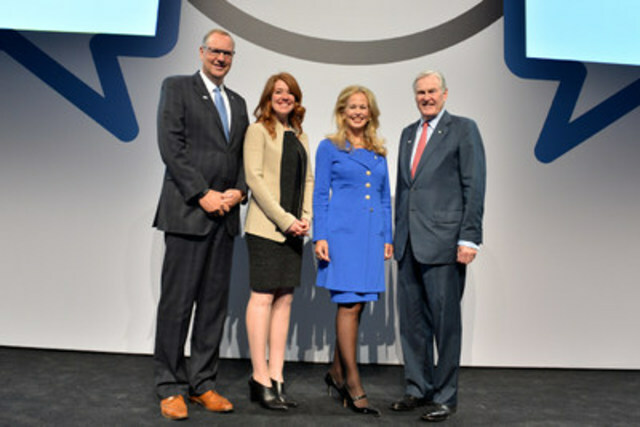 "Canadians have fully embraced the mental health cause, reaching out to those who struggle, making their own voices and stories heard, fighting the stigma around mental illness while also driving Bell Let's Talk action in anti-stigma, care, research and workplace programs by getting engaged," said George Cope, President and CEO of BCE and Bell Canada. "Most Canadians, especially young people, say they've seen a significant, positive change in awareness and attitudes around mental health in the last 5 years. But as we celebrate our collective progress, it's also clear to all that much work remains. We have momentum in mental health, so let's keep the conversation going. On behalf of everyone involved in Bell Let's Talk, I am proud to announce a 5-year extension of the initiative and an increase in Bell's funding commitment to $100 million or more, based on the continued engagement of Canadians in Bell Let's Talk Day." 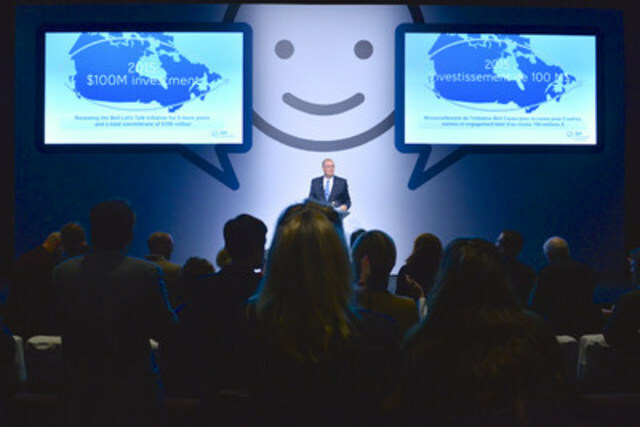 Announced on September 21, 2010, Bell Let's Talk began a new conversation about mental illness, a pressing national health concern beset by a unique stigma and far underfunded and underserved relative to its impact on every Canadian. Mental illness remains the #1 cause of workplace disability and costs the national economy more than $50 billion each year. 1 in 5 Canadians will struggle with a mental illness at some point in their lives, but as few as 1 in 3 seek the help they need, largely because of the lingering stigma. Bell Let's Talk is helping move Canada's mental health forward based on 4 action pillars: Anti-stigma, care and access, new research, and workplace leadership. 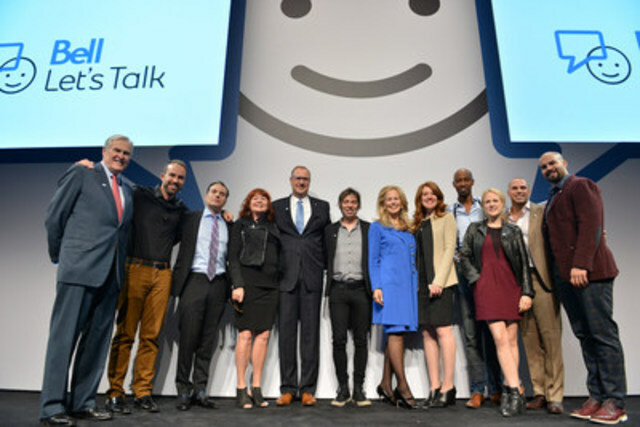 Since its launch, Bell Let's Talk has funded more than 600 mental health partners around Canada, from the largest health care institutions and universities to the smallest community organizations in every region, while encouraging engagement by Canadians in the cause with high-profile anti-stigma campaigns like Bell Let's Talk Day and Clara's Big Ride for Bell Let's Talk. "As national spokesperson for Bell Let's Talk these last 5 years, I have been amazed and overwhelmed by the passion of Canadians everywhere in sharing their stories and ideas on how we can make things better for all who struggle," said Canadian Olympian Clara Hughes. "Together we've shown that Canadians are ready to lead the world by making our nation the first to be free of the stigma around mental illness. We've made incredible progress in the last 5 years, Canada. Let's keep that spirit rolling forward!" Bell Let's Talk was originally launched with a $50 million donation by Bell. Committed to growing its funding though the engagement of Canadians in the cause, Bell also donates 5 cents for messages of hope and support sent on Bell Let's Talk Day, including calls, texts, shares and tweets (#BellLetsTalk was the #1 Twitter trend in Canada and worldwide on Bell Let's Talk Day 2015). With approximately 470 million of these interactions by Canadians over the last 5 Bell Let's Talk Days, Bell's total commitment to mental health has grown to $73,623,413.80. Bell has increased its funding target to $100 million by the end of 2020. But as Canadians continue to drive Bell donations with their engagement in the cause on Bell Let's Talk Day, the total amount could be much higher. The next Bell Let's Talk Day is set for January 27, 2016 and the team continues to welcome new spokespeople and ambassadors. Last year, Clara and Québec spokespeople comedian Michel Mpambara and singer-songwriter Stefie Shock were joined by TSN Host Michael Landsberg, entertainers Howie Mandel and Mary Walsh, comedian Kevin Breel, CFL player Shea Emry and professional golfer Andrew Jensen. New to the Bell Let's Talk team this year are singer-songwriter Serena Ryder, CFL player Étienne Boulay and actor Marie Soleil Dion. "I've been part of the mental health community for many years and can safely say that Canada has become a true world leader," said Mary Deacon, Chair of the Bell Let's Talk initiative. "There has never been a time when more people were talking so hopefully about the advancement of mental health or more positive action was being undertaken at major institutions and the grassroots level alike. Bell Let's Talk helps drive engagement in mental health across communications platforms, but it's the active participation by Canadians in the conversation that has made this incredible progress happen. Thank you everyone for joining the mental health movement!" Bell Let's Talk partners report that approximately 450,000 people have already received mental health support through a Bell Let's Talk funded program – 240,000 of them children and youth – 6,000 staff and volunteers have received additional training, and 1,000 Canadian military families have received mental health support. A 2015 Nielsen survey undertaken on behalf of Bell Let's Talk found that 81% of Canadians were more aware of mental health issues than 5 years ago, 70% think attitudes about mental health issues have changed for the better, and 57% believe the stigma around mental illness has been reduced. The numbers are even more impressive among young people aged 18 to 24: 87% are more aware of mental health than 5 years ago, 79% think attitudes are better, and 65% believe the stigma has been reduced. "The Bell Let's Talk campaign has worked so well because it recognizes the importance of partnerships and working with existing organizations and grassroots groups from coast to coast to coast," said the Honourable Michael Wilson, Chair of the Mental Health Commission of Canada. "And it has worked because Bell has led by example. They have provided leadership on workplace mental health, starting with their own company first, and all their efforts have sent a strong message to people that it's okay to talk about mental health no matter who you are." Bell Let's Talk initiatives have included Clara's Big Ride for Bell Let's Talk, Clara Hughes' epic 11,000-kilometre bicycle journey to communities around Canada to help make ours the first nation free of the stigma around mental illness; the introduction of new annual community funds supporting grassroots mental health initiatives across Canada, in our Northern territories and for military families; the world's first university chair in anti-stigma studies at Queen's University; funding and implementation of the world's first voluntary standard on workplace mental health; Canada's first biobank of biological, social and psychological data at the Institut universitaire en santé mentale de Montréal; the Bell Gateway Building at CAMH, the first mental health facility named for a corporation; and the first university-certified workplace mental health training program. Approximately 8,000 Bell managers across Canada have received training in mental health support. For full details on the progress of Bell Let's Talk over the last 5 years, please visit Bell.ca/LetsTalkProgressReport. Bell Let's Talk is working with Canadians everywhere to create a nation free of the stigma around mental illness. Overcoming the fear and silence is the most important step in driving action and helping ensure those who struggle can seek and receive the help they need. To learn more, please visit Bell.ca/LetsTalk. "Together, we must fight against prejudice and reduce the stigmatization associated with mental health. The work carried out by partners in the field, particularly the Bell Let's Talk initiative, help knock down barriers and raise awareness among employers and the general population." "Mental health awareness, services and support have been integral parts of my government's social agenda. To successfully address the negative stigma associated with mental illness we really need a collaboration of government, business and our entire society. Initiatives like we have undertaken provincially with our 'Understanding Changes Everything' social media campaign, coupled with the great work of companies like Bell through its 'Let's Talk' campaign are going a long way to build positive awareness." "It's great to see so many New Brunswickers adding their voice to the conversation through the Bell let's Talk initiative. By doing so, we are making a real difference in the lives of those affected by mental illness and their families." "Mental health is a critical component of overall wellness and, along with physical health, a cornerstone of PEI's wellness strategy. That's why the support of partners like Bell and initiatives like Bell Let's Talk are so important, they are helping to transform the role mental health plays in our individual and community health." "Nova Scotia commends Bell Let's Talk for its leadership in bringing people together and working to create a better future for all those affected by mental illness. We believe in that same future, recently providing funding for mental health clinicians for youth in our schools. We look forward to continuing the momentum Bell Let's Talk has generated and believe there are more great things to come." "Thanks to the many committed people across our country who are responsible for initiatives like Bell Let's Talk, Canadians' conversations about mental health have become more frank, more thoughtful, and less fearful. Reducing the stigma of mental illness is critical for our communities and families to flourish. In fact, many lives depend on it. I know these conversations will continue to bring understanding and relief." "Thank you to Bell Canada for its extraordinary efforts to raise awareness about the importance of mental health and thank you to the thousands of caregivers across Canada supporting people who have sought help, and encouraging those who might be struggling alone. All Canadians must be approach this issue with benevolence and compassion. We need to imagine what it's like to be debilitated by fear, sadness or anxiety, and even worse, what it's like to feel guilty, weak or ashamed in the bargain. That's the reality for millions of Canadians. We need to change that reality. That's why this investment by Bell Canada is so important." "Talking about mental health issues is key to creating greater awareness, acceptance and action. Thanks to campaigns like Bell Let's Talk, we have made progress, but the journey is not over. We need to continue to work together to end the stigma around mental illness and encourage people to get support." "One in five of us Canadians will experience mental health issues in our lifetime. By working together, we can end the stigma around mental illness. It's wonderful to see Bell Canada once again step up and continue the conversation with their ground breaking initiative to help those struggling with mental health." "We all know someone who has or will suffer with mental health issues. Thanks to Bell Canada and its groundbreaking Bell Let's Talk campaign, we are on the path to never having to deal with those issues alone nor in silence." "We have all been impacted by mental health issues at some point in our life. The Bell Let's Talk initiative spurred us to do more in order to keep the conversation going on mental health in order to break down the stigma. In May, we released the video "You're Not Alone" to get people talking about this issue. The video featured well known northerners holding messages of hope and expressing their support for people struggling with mental health issues to talk to someone, and we encourage everyone to share it to keep the conversation going." "As Co-Chair of the Canadian Alliance on Mental Illness and Mental Health, as well as being a family member and a recipient of mental health services, we as a country are most indebted to Bell for their "Bell Let's Talk" initiative around mental health and mental illness. Indeed, it has energized the conversation concerning stigma reduction and the kind of mental health services we want in Canada. Congratulations to the "Bell Team" and our champion Clara Hughes for speaking wisdom and truth to our times!" "Bell Let's Talk has helped reduce the stigma and change the conversation related to mental health, helping people to know it is ok to seek help when they need it. There is still more work to do, so let's continue the conversation." "Those in the military community face unique challenges that have an impact on their wellbeing – frequent moves, deployments, isolation, and operational stress injury, including PTSD. The Bell True Patriot Love Fund supports community-based mental health programs to help military families overcome those challenges. Spanning across the country, funded programs have included suicide prevention, couples and family therapy and animal support therapy. "Bell Let's Talk has had a nationwide impact over the past 5 years reducing stigma, improving access to care and workplace health, and investing in research and innovation to address the challenge of mental health. Bell's corporate leadership on mental health has been extraordinary." "Bell's million dollar gift to telemedicine at the Royal has enabled clinicians to provide over 4500 mental health sessions to individuals in Eastern Ontario over the past five years. Many of these individuals live in rural areas where there is limited access to mental health services. With Bell's support we have been able to establish clinics in the 11 key communities in the Eastern Ontario region served by The Royal. On behalf of clinicians, patients, and families we would like to thank Bell for their generous contribution to mental health services in our region." "Thanks to Bell Canada's financial support, our researchers were able to design three mobile applications to assist patients in their treatment and recovery. We're very proud that these innovations are a first in Québec in use of mobile technologies in mental health." "Seniors are often the most isolated population group and yet there are few programs to address their mental wellness. We are changing this reality through a partnership between the Bell Let's Talk Community Fund and the Beauséjour Family Crisis Resource Centre. Front-line workers making home visits will not only be able to detect depression among seniors in our community but will also be able to refer to those in need to the Centre for services. Suicide among the senior population is on the rise and through the Bell Let's Talk Community Fund we have the potential to save lives." "Thanks to the Bell Let's Talk funding, CMHI and its community partners have been able to offer valuable trainings on mental health and suicide prevention at no cost to the public. Through such trainings, 38 community members to date have increased their knowledge and intervention skills to better manage potential or developing mental health problems. Ultimately, this funding has strengthened our community by building capacity within." "The Jewish General Hospital appreciates Bell's support for the Transitional Care Team. Bell's strong commitment to mental health is inspirational, and the funding allows us to help so many children and families." "In 2014, with support from the Bell Let's Talk Community Fund, a six-bed specialized child and adolescent mental health unit opened at NBRHC to serve the districts of Nipissing and Temiskaming. Now youth can receive care and treatment for mental illness in a suitable environment, close to their families. Bell continues to inspire and have an impact on our communities by helping us continue the important conversation about mental illness." "The Bell True Patriot Love Foundation grant has helped us rescue 7 veterans, pair them with their service dogs, re-unite them with their Families and Friends. What do you call such life altering, game changing support from Bell True Patriot Love? Pawsome." "Bell Let's Talk has changed the lives of 106 youth with mental health issues living in Vancouver. Through Bell's generous support, these youths have received access to critical mental health resources and, as a result, they've gotten off the street or out of shelters and into their own housing." "The national Bell Let's Talk campaign puts mental health squarely into the conversation, and that has been a tremendous aide for us. We're trying to improve access to services for our students, and the first step is removing the barriers. There isn't a more stubborn or difficult obstacle than stigma—we need to be able to talk about mental health in order to take any meaningful action on it."